Just added this month....Click here for more details on our Remote Location Workshops! Aerial arts is a powerful, emotional art form communicating through yoga and acrobatics on suspended silks. 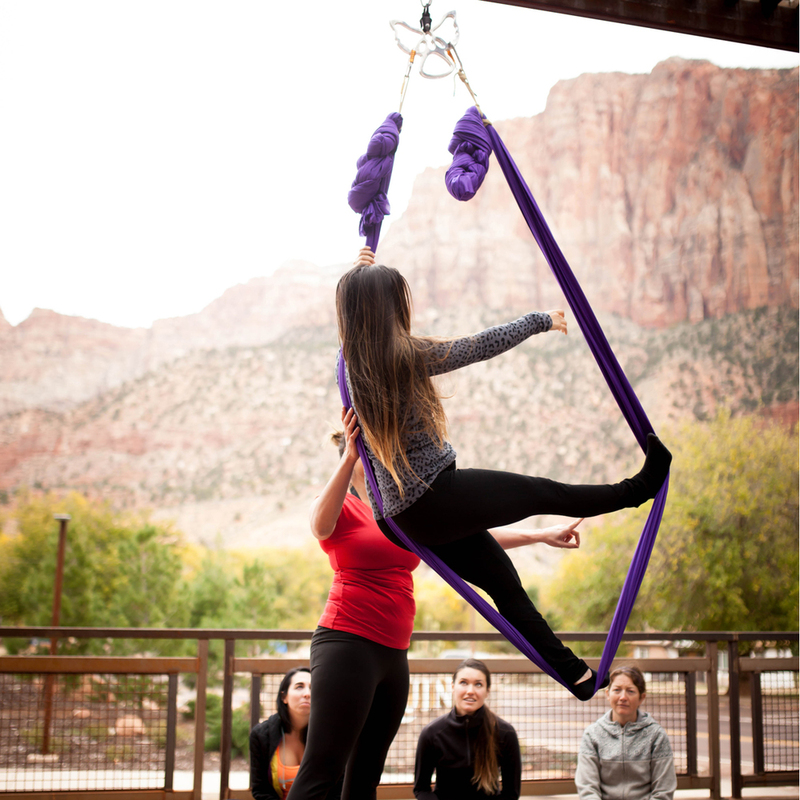 Our Zion series workshops offer a depth of knowledge, rigging expertise, and one-on-one experience which empower both newcomers and intermediate performers in a 2- or 3-Day intensive workshop setting. 3 Person Minimum - Gather your friends and we will find the best date for you. Please plan on arriving the evening before the scheduled start date of your workshop. 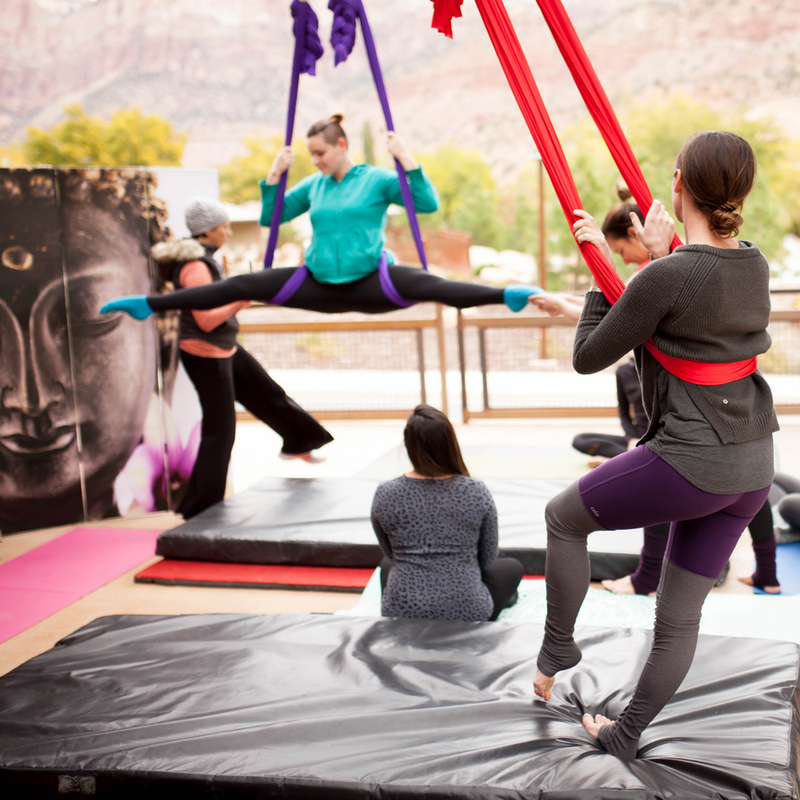 Our aerial arts intensive workshops include aerial yoga, hoop and dance along with rigging for aerialists classes. 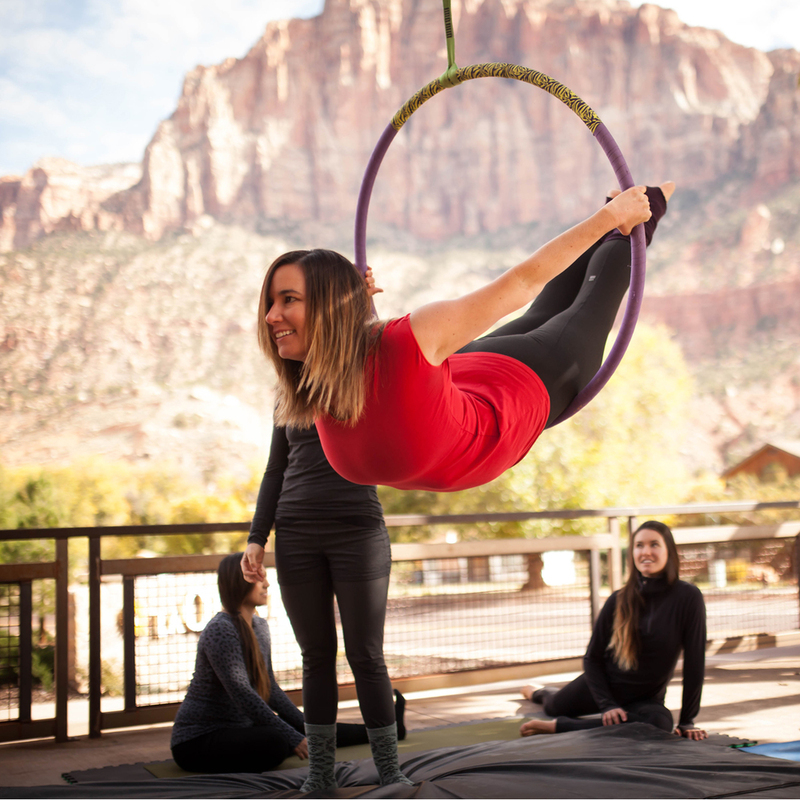 Situated in the heart of beautiful Springdale, Utah our classes will be held outdoors with breath taking views of Zion Canyon. Please make sure to dress accordingly and bring plenty of layers to class. Beverages and snacks will be provided along with lunches for all workshop days and dinner on the second night of your workshop. You will also have some free time to explore Zion National Park, but you may plan additional days to hike the Zion Narrows, or book an outdoor adventure with the Zion Guru! Accommodations - We recommend lodging at one of the many hotels in Springdale, all within a 5 minute drive or 10 minute walk of Zion Guru. We recommend the LaQuinta Inn and Suites in Springdale, Quality Inn Montclair, Desert Pearl, Under the Eaves, and the suites at Cliffrose Lodge. Additionally, camping is available in Zion at the Watchman Campground or in Springdale at the Zion Canyon Campground. 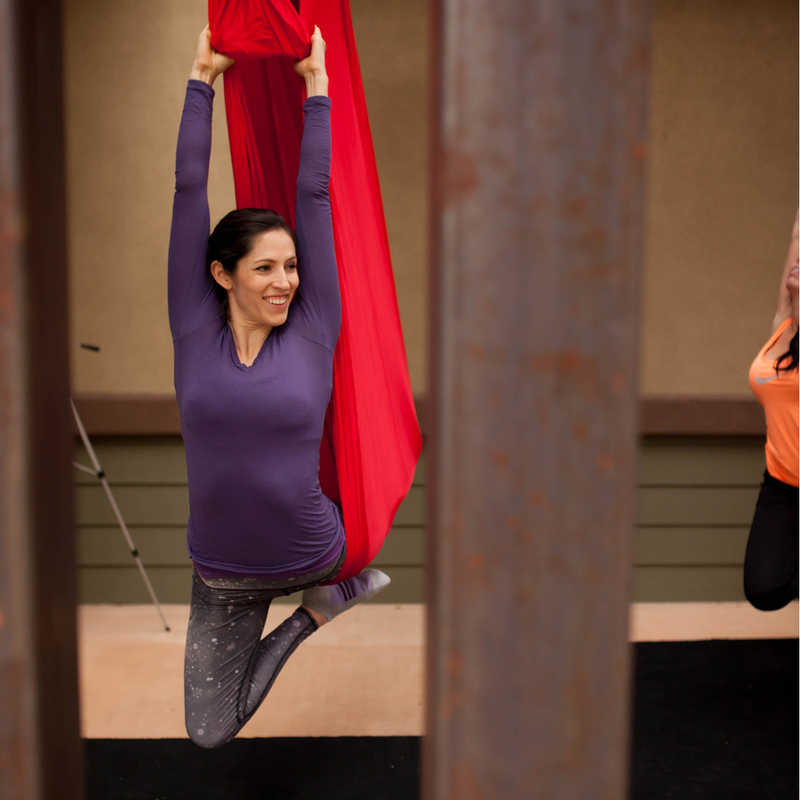 No previous aerial arts / yoga / dance experience required, open yourself to a new endeavor of the body that’s both simple and excitingly fun! Workshops are physically demanding, and you will find strength you did not know you had. Please consult your physician if you have any doubt of your ability to participate. If you deal with glaucoma or other pressure related issues, traumatic brain injury, heart disease, high or low blood pressure, pregnancy, spinal issues, epilepsy, or recent surgeries, including Botox, implants, orthopedic work of any kind, please refrain from registering. What to wear to class: Wear a shirt that covers your underarms completely & comfortable, fitted workout pants that go below the knee. Our classes will be held outdoors. Please dress in layers. Temperatures may vary. Daily temperatures during the event could be as low as 40˚F at night and as high as 85˚F during the day. Please pack accordingly. Summer Davies is the Founder of Vertical Art Dance™ Co., an Aerial Arts program developer & retail provider. Vertical Art Dance™ also specializes in Remote Aerial Performances which inspires its viewers. Summer has successfully completed both level 1 & level 2 aerial yoga teacher trainings in Boulder Colorado with Aircat Aerial Yoga and holds a certificate in dance she earned from IDA Hollywood Contemporary School of Dance. She also has completed 120 hrs of remote and urban rigging training.